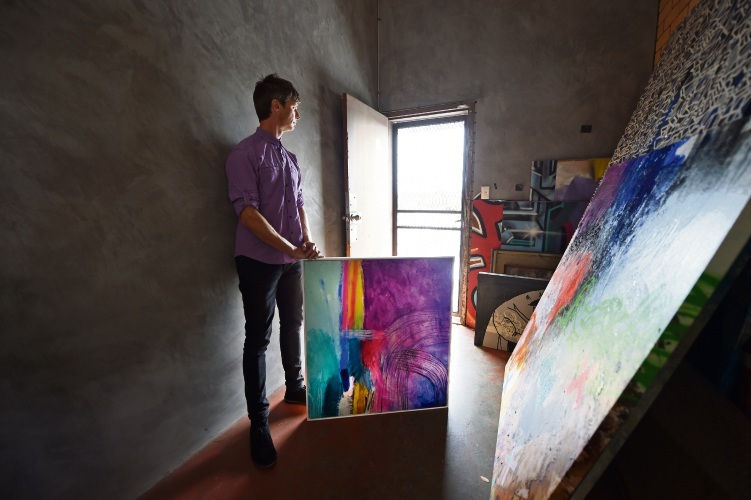 GIVING back to the community is what Beaconsfield artist David Spencer aims to do. This year he is donating a piece for Art for Epilepsy’s online art auction, which has been running for three years and raises funds to support people living with epilepsy. The bidding is available from May 1 and runs for the entire month. Spencer said he felt like he had been an artist his whole life. “It’s one of those things your parents notice when you are a kid and it developed in primary school,” he said. “I went to Applecross and did fine arts for five years, then I went to Tafe for three years then I travelled the world to get a story. The abstract artists said he constantly changed his style of artwork. “My abstractions are based on emotions, responses to feeling which happens when I paint,” he said. “The main objective of painting is to keep trying different things, not stopping. A couple of months ago Spencer said Art for Epilepsy approached him to ask whether he would like to donate a piece of work. “Every year I donate a piece to a charity, I try and do a different charity every year,” he said. “Last year I donated a piece to Camp Quality for youth cancer, I also do fundraisers for school and stuff like that. “I just want to give back, I really enjoy it. His artwork is called Kelly watched the stars inspired by the Air song, Kelly Watch the Stars. Art for Epilepsy includes artists from around Australia including nine West Australian artists. Over the past two years the online auction has raised more than $80,000.